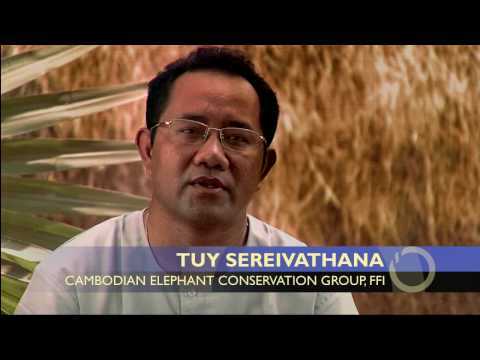 Sereivathana Tuy introduced innovative low-cost solutions to mitigate human-elephant conflict in Cambodia, empowering local communities to cooperatively participate in endangered Asian elephant conservation. Cambodia has a long history of peaceful coexistence between people and elephants. Its most famous building, the spectacular Angkor Wat temple, was built out of stone and marble with the help of elephants in the 12th and 13th centuries. Elephants, then abundant in Southeast Asia, served as the critical heavy machinery, carrying building materials and providing the necessary force to hoist pulleys and move stone. Long revered in Hindu and Buddhist traditions, elephants continue to hold deep meaning for followers of those religions today. In Khmer history following the Angkor period, several kings believed that possessing rare white elephants could bring glory for the country. However, despite their cultural significance, after a period of unregulated development, Cambodia’s wild elephant population has dwindled significantly. Cambodia is a country in transition, having emerged from a violent and isolated past under the Khmer Rouge in the 1970s and subsequent conflicts between the Khmer Rouge and Cambodian government in the 1980s. Now, growing as a constitutional monarchy, Cambodia has experienced a dramatic increase in population and an explosion of unregulated development. This has placed enormous strain on the country’s natural resources, particularly its now-fragmented rainforests. Migration routes of endangered Asian elephants have been disturbed by this development, leading to conflicts between local communities and elephants. With their habitat decreasing, elephants are destroying farms as they look for food on the edges of the forests. Many rural farmers have been forced to relocate as a result of development in other parts of the country, tilling small tracts of land on the forests’ edges to feed their families. Desperate farmers have, in the past, killed elephants to protect their crops. These migrant farmers have no experience living in wildlife areas and no bond with the forests or the elephants. They are extremely poor, have little education and no political power to resolve land and livelihood conflicts. Sereivathana Tuy (Vathana) was born in 1970, the same year that Cambodia entered into a period of extreme political upheaval. In 1975 his family fled from the city and the brutal Pol Pot regime to the rural village where Tuy’s father’s family lived. Tuy’s parents, both well educated, taught school in the mornings to the local children and farmed in the afternoon to make ends meet. During his childhood years in the countryside, Tuy developed a deep respect for nature and was particularly fascinated with elephants. Later, when he was awarded a scholarship to attend university in Belarus, he focused on forestry studies and returned to Cambodia committed to working to conserve his country’s natural resources. As a ranger with Cambodia’s national parks, Tuy worked throughout the country, connecting with rural communities and learning more about elephant migration and ecosystems. In Prey Proseth and Trang Troyeng, two communities not far from Tuy’s ancestral home where 30,000 people live on the forest’s edge, he became aware of the lack of capacity within these communities to manage the human-elephant conflict they faced. In response, Tuy began developing his community-based model, spending time with the farmers in their fields and building their trust. He taught villagers how to use hot chilies, native plants, fences, fireworks and fog horns to ward off elephants. He demonstrated the benefits of crop rotation and diversification. Tuy encouraged farmers to alternate rapidly-growing crops such as cucumbers, which can be harvested several times a year before the elephants discover they are ripe. With this type of system, only one of many annual harvests would be damaged in the event of an elephant raid into a farmer’s field. More importantly, he fostered cooperation among the farmers to work together as a community, encouraging them to organize overnight guard groups to protect the fields. Tuy was also able to revive in the communities the national and religious pride attached to the Asian elephant, as many Cambodians revere elephants as sacred Buddhist symbols. Because Tuy understood the dynamics of this environmental problem, he was able to develop simple, effective strategies and practical solutions at the grassroots level. During this time, Tuy, affectionately known as “Uncle Elephant” in the communities he works with, left his position as a National Parks officer under the Cambodian Ministry of Environment in 2003 to assume the role of Human Elephant Conflict Team Leader for the Cambodian Elephant Conservation Group, a project co-sponsored by Fauna & Flora International, the Cambodian government and community organizations. Tuy later became full-time manager of the project in 2006. In 2008, Tuy helped set up schools and brought teachers to the isolated communities dealing with human-elephant conflict. He saw this as another opportunity to embed the elephant and wildlife conservation message into the community. With support from Steve Irwin’s Australia Zoo, the US Fish & Wildlife Service, the Los Angeles Zoo and International Elephant Foundation (IEF), Tuy was able to set up four schools. One day per week, these schools teach 250 children about the natural environment, elephants and other wildlife, and how to live in harmony with nature. Since his work began, Tuy has seen significant success. At the start of the decade, elephant killings due to crop raids were not uncommon. As a result of Tuy’s involvement with the project, there has not been a single confirmed elephant death due to human-elephant conflict since 2005. As elephant populations throughout Asia continue to decline, Tuy’s program has brought hope to local communities and bettered the prospects of endangered Asian elephants in Cambodia. 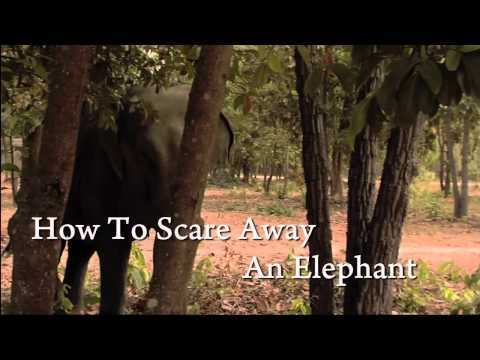 Tuy’s model is now being used in neighboring communities and is being considered in other countries with human-elephant conflicts such as Vietnam and Indonesia. He now works as the Country Director for Cambodia at Wild Earth Allies. Tuy Sereivathan, receiving his award at the 2010 Goldman Prize ceremony. 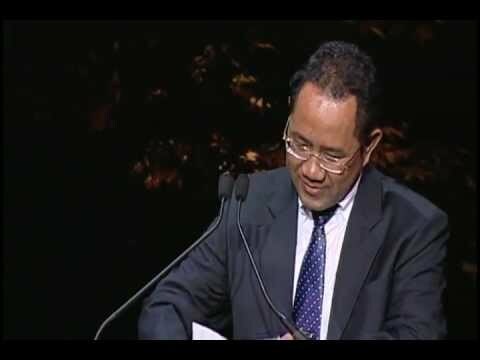 Tuy Sereivathan, accepting his award at the 2010 Goldman Prize ceremony. Tuy Sereivathan, 2010 Goldman Prize winner for Cambodia.